This March, Bryan Hymel makes his Deutsche Oper Berlin debut in Verdi’s classic tragedy Rigoletto. Performing the role of the Duke of Mantua, the American tenor sings alongside George Gagnidze as the title character and Olesya Golovneva and Olga Peretyatko alternating the role of Gilda. Andrea Battistoni opens the production, leading the Orchester and Chor der Deutschen Oper Berlin on March 25 and 31. 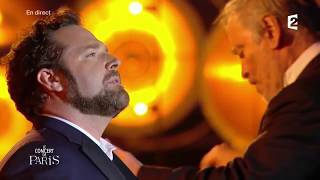 Bryan returns to Berlin for two final performances of Rigoletto under the baton of Giampaolo Maria Bisanti on June 24 and 30. In the 2016-17 season, Bryan Hymel returns to the Metropolitan Opera for Rossini’s Guillaume Tell and to the Opéra National de Paris for Bizet’s Carmen. In October 2016, Bryan opens Pierre Audi’s new production of Guillaume Tell as Arnold alongside Marina Rebeka as Mathilde and Gerald Finley as the title character. Later in the season, the American tenor performs Carmen at Opéra National de Paris, returning to the Opéra Bastille after a run of La traviata in the summer of 2016. The American tenor continues the 2015-16 season with a recital at Wigmore Hall on February 25 with mezzo-soprano Irene Roberts, Rigoletto at Deutsche Oper Berlin, La bohème at the Metropolitan Opera, and Madama Butterfly at the Chorégies d’Orange festival. This February brings Bryan Hymel to Prague and Paris to perform two concerts with Greek soprano Irini Kyriakidou and the PKF – Prague Philharmonia and to London for a recital with Irene Roberts. On February 14, the American tenor joins the PKF – Prague Philharmonia and conductor Paolo Bressan at the Smetana Hall in Prague for a program of Puccini, Mascagni, Puccini, Massenet, Reyer, and Gounod. Irini also performs Puccini, Dvorák and Bizet, and the duo will sing selections from Puccini’s La bohème. In Paris, Bryan and Irini reprise the same program on February 17 at the Théâtre des Champs-Élysées. Bryan then performs a special recital at London’s Wigmore Hall with mezzo-soprano Irene Roberts on February 25. As part of the Rosenblatt Recital series, Bryan sings songs and arias by Vaughan Williams, Gounod, Mascagni, and Bizet. Tune in this evening to hear Bryan’s “ardent, arching phrases” in Puccini’s love story via live broadcast (GB Opera Magazine). The webcast begins at 7:25 p.m. EST and is available online. La bohème continues at the Met with performances January 16 and 23; April 15, 21, 25 and 29; and May 5.